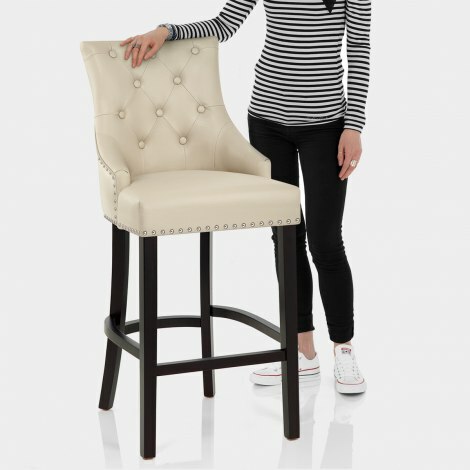 A luxurious piece for your kitchen or bar area, the Ascot Leather Bar Stool Cream is the ideal statement piece. Upholstered in sumptuous cream bonded leather, the webbed seat pad provides outstanding comfort. Stylish and sophisticated, the seat is edged with opulent chrome studs and the quilted button detail in the backrest lends an exclusive feel. Plus, the decorative chrome ring on the rear of the seat makes for a glamorous feature. The sturdy fixed height frame is crafted from solid wood, and has a sleek black satin finish that offers a chic contrast to the seat. Protective plugs work to preserve floor surfaces and complete the Ascot Bar Stool. "Best bar chairs! Thank you very much"
Very fast and efficient service, delivered on time. Very happy with the product, I spent a bit on my new kitchen and it compliments it brilliantly. Very comfortable and very easy to keep clean. A beautiful stool, very happy with its quality and look fits in very well with my decor, prompt delivery and any queries dealt with immediately. Comes flat packed to build yourself - a fairly easy process. Result is a very stylish and comfortable stool.